Principles of Macroeconomics - 2e covers the scope and sequence of most introductory economics courses. The text includes many current examples, which are handled in a politically equitable way. The outcome is a balanced approach to the theory and application of economics concepts. The second edition has been thoroughly revised to increase clarity, update data and current event impacts, and incorporate the feedback from many reviewers and adopters. Principles of Macroeconomics 2ed cover is copyrighted by Rice University. It is not subject to the Creative Commons license and may not be reproduced without the prior and express written consent of Rice University. 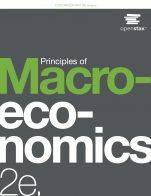 Principles of Macroeconomics - 2e (OpenStax) by Steven A. Greenlaw, University of Mary Washington, David Shapiro, Pennsylvania State University, Timothy Taylor, Macalester College is licensed under a Creative Commons Attribution 4.0 International License, except where otherwise noted.